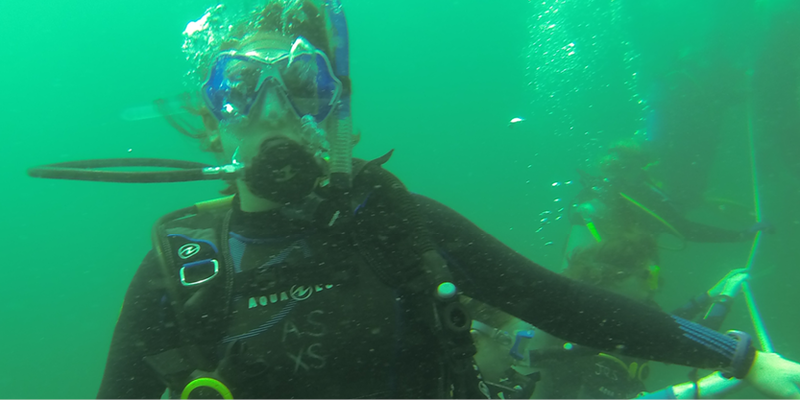 Dive into the world beneath the sea with MarineQuest scuba diving programs! These programs have been designed for teens with a serious desire to earn, or expand on, a scuba certification while exploring marine science. We offered a variety of programs so whether you are already certified, or looking to start, MarineQuest's scuba diving programs are for you. Earn your PADI open water scuba certification while you explore the ocean's amazing aquatic life, beautiful artificial reefs and historical ship wrecks. Learn how scuba can contribute to marine science. Join MarineQuest and explore the ocean through a new lens as you become a certified PADI Digital Underwater Photographer! Learn how to think, observe, and document like a real marine scientist. Are you a scuba enthusiast who loves sharks? Are you interested in fish biodiversity and abundance? If you are, MarineQuest's Underwater Ichthyologist program is perfect for you! Think you want to be a underwater researcher? How about an oceanographer? Maybe you prefer marine technology specialist? Explore these marine scientific career options and more during our two-week O.C.E.A.N.S. program while earning your PADI Underwater Naturalist diving certification. Serious marine science enthusiasts will conduct lab and field-based experimental research while earning their PADI open water or PADI advanced diver certification during this three week program. From SCUBA to AUVs, ocean exploration has challenged men for decades. You can meet this challenge by spending a day with Discover Scuba Diving (no prior experience necessary) and learning how to handle an ROV. Begin your own journey from bikini to wetsuit by participating in a research cruise, operating an ROV, investigating morphological adaptations in marine life, and exploring Discover Scuba Diving. You must register by 5:00 p.m. the Wednesday before your program is to begin. Before completing your application, please review the Cancellation Policy | PDF and the expected MarineQuest Student Code of Conduct | PDF. To complete the teacher recommendation, please have your teacher click here to submit their recommendation. Please Note: A completed application does not register you for your program. All applications will first be reviewed by the MarineQuest Staff and upon acceptance, you will receive an e-mail explaining the next step in the registration process. The MarineQuest staff is more than happy to pick-up and drop-off students at Wilmington International Airport at no cost. An airline request form is required (see above link for more details). Linens are provided - DO NOT bring sheets, pillows, and blankets. No electronic equipment (including cell phones) is allowed. You will receive a Welcome Packet with detailed information on what to bring after registering. • Note that prices, content, dates, and times are subject to change without notice. • Questions? Call 910.962.2640 or send an e-mail to marinequest@uncw.edu.